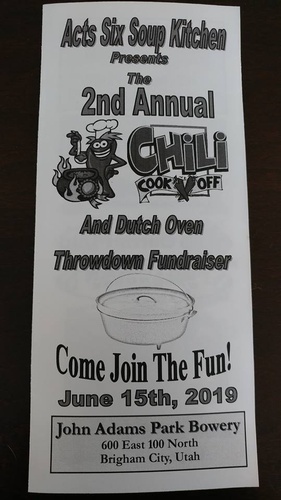 Acts Six Soup Kitchen presents the 2nd Annual Chili Cook off and Dutch Oven Throwdown Fundraiser. Come join the fun. Dutch Oven Contest, Vendors, and Acts Six's Great Chili for sale to the public, at John Adams Park in Brigham City. Low entry fee's for contestant and vendors.